The society is currently raising �150,000 to repair Sandhill Lock. Pocklington Canal Amenity Society (PCAS) has been chosen to benefit from the Co-op Local Community Fund. The fund sees Co-op members nominate their favourite causes for a cash boost. The retailer has raised thousands of pounds via its charitable scheme in this area over the past two years. 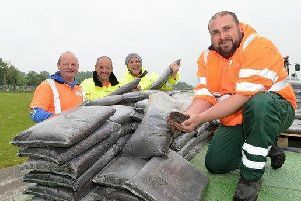 Tim Charlson, at the Pocklington Canal Amenity Society, said: “At a time when funds for charitable organisations are becoming more difficult to access, we’re incredibly grateful for this opportunity to make a real difference to a Pocklington-based amenity. “We are currently raising £150,000 to repair Sandhill Lock as part of our aim to completely restore the canal. “The lock is the most derelict of the remaining three requiring restoration and needs much brick repair and new lock gates. We aim to begin preparatory work very soon. “To help us raise vital funds we are be relying on Co-op shoppers. Every time they buy Co-op own-brand products they get a 5% reward for themselves and a further 1% goes to local causes like ours. “When a community comes together we’re able to achieve great things, so we hope you can help promote our project.